Sad to report that Brian Gillis has passed away. He was a brilliant close up magician. 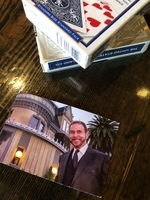 I was lucky enough to see him several times at The Magic Castle and also at a private party. You can also find him on Youtube performing on The Tonight Show with Johnny Carson. Great guy. Great magic. Sad loss for our community. I'll miss him. RIP Master Close up performer. Condolences to his loved ones. I never met Brian or saw him live, but I did see him in the "Magicians: Life in the Impossible" documentary and I liked his presence. RIP. I’ll never forget watching Brian Gillis on Carson. Though I had studied magic as a child, other interests overtook my hobby. In my late 20’s, I was hooked again. I wanted to entertain just like this guy. Years later, I was on a gig, unaware I was opening for Brian Gillis. I saw him perform frequently at the Castle. I had the pleasure of sitting with Brian many times. He had a colletion of suit jackets that would have made Liberace jealous. Despite his swagger as a performer, he was a quiet, gentle man. He spoke about the power of mastering a finite repetoire, of his days as a student of Eddie Fechter and the importance of keeping effects simple and direct. Brian was wary of the new and latest greatest, he rarely lectured or marketed effects. Recently, Gregory Wilson encouraged Brian to release his Peek Pack, a brilliant meld of think-a-card and multiple selection. I saw it in action numerous times at the Castle, it flummoxed me every time. I sure will miss that smile, those eye-popping jackets, the lightening wit and the tidbits of sage advice. So Sad, I went to his Castle many times and worked on routines with him and other great performers. Brian's watch steal was the best! I just realized that I met Brian when I was at the Castle with Howard, Nico, and Steve Christian. We were talking about him potentially doing a lecture for our forum and he gave me his card. I’m sorry to hear the news of his passing. He seemed like a nice guy. Jamy Ian Swiss has written up a nice remembrance/appreciation of Brian Gillis for Magicana. Thank you Chris W for sharing that post from Jamy. I hadn't seen it and it makes me smile to read such a lovely tribute to Brian. He deserves it. Like Jamy said, Brian was not known for releasing much material to the community. But he was a well known worker. And man, if you saw him work, you would not soon forget it! I mentioned in a different thread that the watch steal was something I could never learn but I wish I did/could. Seeing Brian do it was the inspiration. For those that don't know much or anything about Brian Gillis, I hope this thread helps you discover him. That was my first time seeing him, and it hit me like a hurricane of polished, inexplicable, high-velocity magic. Close-up magic on TV at that time essentially was the slow-boiling, somnambulant tones of early David Blaine, and this was something very different: a powder keg of magic lit up by a working pro. Seeing "Magicians: Life in the Impossible," I was reminded of Mr. Gillis and surprised by his vulnerability in allowing that portrait of him to be presented as it was. I looked up every video clip I could find of his performances online at that time, including many of the ones making the rounds now. It was a joy to get better acquainted, even if only via the wonders of internet streaming. Besides being a great magician, he seems to have been a genuinely nice man. Because of Brian, I got to spend some time with Eddie Fields. Are you thinking of him as opposed to Fechter?